That is a very good question. At this time, I would not hang my hat on it. My inexperienced tip: Wait a couple of weeks. It's a bit risky to assume there will be no frosts in your location now. There's always a chance of a cold spell towards the end of April - early May. And even if the day is still warm and like 65F, there could still be a radiation frost at night under crystal clear skies. I have had 70F days drop down to 30F overnight many times in April here, when it is clear skies allowing all the heat to radiate up into the atmosphere overnight. Plenty of times they have forecasted a low of 35F, but the clear skies have allowed it to go down to 30F resulting in a frost. Usually my last frost is around April 20th, but I have known my last frost to be as late as 20th May and as early as 15th March. I'll never plant out tomatoes, cucumbers, peppers etc until 2nd week of May, just in case. Unless of course the forecast is ridiculously promising in late April. But usually it is better to be safer than sorry. I have personally never seen frost past this date in my time living here, but I will certainly keep my eyes on the forecast. My bananas are already coming up and everything, so a frost would not be good! Yeah April is a pretty solid month to say frost free. The record snow for most of the DMV in the month of April is flakes falling with the day warming to over 50F shortly after. 99% of most frosts end in mid march around here, but yes we can get cold spells, but no frosts outside of microclimates that collect cold air. My first day to consider planting is March 15th(still in the technical frost period), but by then colder hardy flowers and other plants are sprouting and even some trees bud and flower in march. The cherry blossoms are big in mid to late March for a reason. Yes some times its pushed to early April, but thats rarer than late March. Just my $.02 from 35+ years living here in the DMV. I have a low of 27F forecast tonight which will be a record low for this date if we see that. But fingers crossed that will be our last frost now, because we have highs well into the 70s forecast by next weekend, and lows in the 50s by then. I am eager to get my tomatoes, cucumbers, peppers etc in the ground outside as I have so many this year, but this area won't be totally frost free for another 3 weeks. I might just chance it and put them out next week though, as I think the last frost will be tonight. Yes it's warm and this year is looking great but FYI , check April 2014 and 2008 on Weather underground history. Frost can occur at temps higher than 32F. Up to 35-36 is not uncommon. April 10th is not absolute. My entire winter low was 28° and our tomatoes were in the ground since mid March! I wish I could put tomatoes out in mid March! I see you are at 37N though, whereas I am at 51N. So you are around 1000 miles closer to the equator than I am. My location is at the same latitude as Saskatoon in Canada. Being in southeastern VA, I've never experienced a frost after mid-April and certainly have never seen snow in April. Late March or early April is typically the beginning of the growing season. Just to be safe, I usually wait until April 15 before I plant anything sensitive to frost. Alternatively, I pay attention to when the native tree species begin to leaf out. Of course, that is not always reliable. I remember one year when nearly the entire month of March was 70s and 80s with no frost, but we ended up having one night of frost in early April that damaged the new growth on our native southern live oak (Quercus virginiana). Speaking of, the live oak already has new growth and last year's leaves are beginning to drop. The forecast looks good, and the likelihood of a frost occurring is very low. It sure would be devastating if we did though. 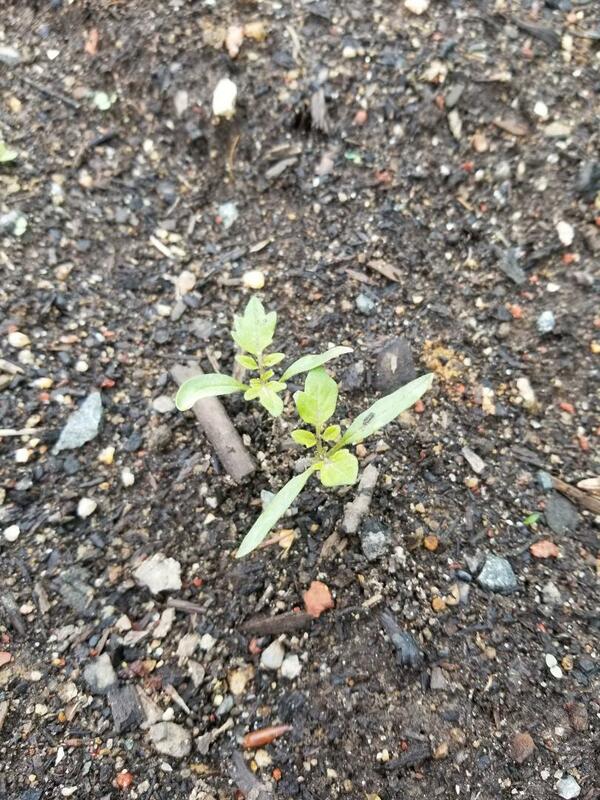 I'm pretty sure these are tomato volunteers from last years tomatoes that fell on the ground, they have been popping up all around where my tomato plants where over the past few weeks. I looked on Weather Underground on my computer and looked at the current temperatures map, and where it is warmer right now along the coast basically shows where the climate changes from "Mid Atlantic" to truly Southern. My highs are in the high 70s to mid 80s with the lows in the high 50s and low 60s. What are yours? Whould You Consider ALL of Taiwan Tropical? Would you consider all of Taiwan tropical? The tropic of cancer runs right through the middle of it, but it is an island. I probably would.